We know culture eats strategy for breakfast. It's what inspires you to keep coming to work and makes you feel part of something bigger. At FNB, we're entrepreneurs at heart. Which means we have an ownermanager culture. So whatever your role, you'll be expected to step up and take ownership, while being supported all the way. We work in smaller, more agile groups. This makes us more flexible, faster to innovate and able to react more quickly in an ever-changing world. So you'll find a healthy competitive attitude between teams, but a genuine willingness to tackle challenges together and collaborate whenever we can. If that's how you like to work, you'll fit right in. Our values are essential to our culture, how we act and interact with each other. They guide how we work, the decisions we make and the actions we take. And they are what each and every FNBer holds true for themselves. We take accountability for all we do. We step up, take a stand and help out. We remain true to who we are, holding ourselves to the highest standards. We challenge the status quo and tell it like it is. Ethics is our guiding light. We do the right thing always, championing honesty and integrity, treating our customers fairly. We act in the best interests of our customers and our bank. We have a bias for action and strive for effectiveness in everything. So we start with listening and understanding, work smart and get things done. We clarify and simplify, not confuse or complicate. Solving people's challenges is our calling. Which is why we innovate with purpose in mind. We overcome obstacles and smash barriers, constantly improving, working on creating a better tomorrow. Helpfulness is in our blood always. So we embrace optimism, compassion and caring. We pitch up and pitch in, ready with a smile to go the extra mile. We help each other and always deliver on promises. We're not a one-size-fits-all, cookie-cutter type of organisation. We embrace and encourage uniqueness, authenticity and diversity. At the same time, we work hard to create an environment where people feel they belong. So we know that the kind of person who thrives at FNB is special. Curious - you're driven by always wanting to know more and learn more. Obsessed with mastery - you know what it takes to become really good at what you do and are constantly pushing yourself to do it. Courageous - you're brave enough to think and do things differently and are always ready to put your hand up and take ownership. A team player - you believe in the power of teams so you're always part of one, building and leveraging your networks. Emotionally intelligent - you have a high EQ that enables you to truly connect with people, no matter how technical or specialist your role is. Our FNB employee volunteers programme allows you to find a cause that's close to your heart. Through donating time, skills, money or getting involved in fund-raising activities and national drives, you can make a positive difference in South African communities. We believe we can have the biggest impact on people's lives by starting at an early age. Which is why we are passionate about supporting early childhood development through our Help A Creche initiative. During their first six years, children learn at a much faster pace than at any other time in their lives. Through helping various communities in various ways, we're providing the necessary elements that form the foundation of future learning and success. 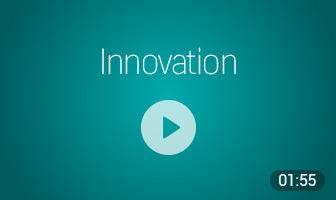 Innovation is the lifeblood of FNB because we believe that the role of innovation is to solve human challenges and make the world a better place. We are continually striving to come up with meaningful innovations, ones that result in game-changing, radical shifts that make people's lives easier, while delivering business value. We want to help people overcome obstacles and remove barriers, simplifying and improving their lives as a result..
We know that innovation is a process beyond just coming up with a great idea. Our Innovators Programme enables innovation across the bank and allows you to participate in each step of the innovation process - from inspiration through knowledge sharing, to ideation, to implementation by connecting teams and individuals to collaborate, and finally celebration, where our innovators receive the recognition they deserve. We also look at how we innovate on a daily basis, constantly looking for better ways of doing things, reinventing ourselves and improving how we deliver on our helpfulness promise. And we're smart about how we do it - seeking out diverse opinions, building on each other's ideas and not duplicating effort. There are always opportunities to network and collaborate with multidisciplinary teams, engage with leadership and constantly learn from colleagues. You'll be able to grow and stretch yourself, and grow your career. By getting involved in projects outside your role, you'll get exposure to new people and areas. You can make a difference by coming up with new ideas, projects and pushing boundaries. If you have a great idea, and the business case prevails, we'll give you the space to realise it. We want you to be able to play to your strengths. Realising your potential means not being confined - through flexible working conditions, hot-desking or structuring your rewards. Everyone can take part in innovation at FNB - as part of your job and outside your immediate role too. Bring a great idea and we'll partner you with the right team to implement it. Life can be stressful. From an onsite wellness centre, gym and crèche at our main campus to innovative employee wellbeing programmes and financial fitness, we'll help you look after all aspects of your health and wellbeing. Our culture of ongoing development means we have the resources to help you with your professional development. You'll find development programmes and knowledge sharing opportunities as well as bursaries. Our environment is designed to unleash potential and tap into human greatness through inspiring spaces that support collaboration and idea sharing, as well as individual work. From collaboration pods to quiet zones and coffee shops, you'll find a space that works for you and the work you need to do. Everyone needs time off to relax, recharge and be re-energised. Or to take care of family matters, or other interests. Our leave policy is generous and even includes sabbaticals, based on tenure and outstanding contribution to FNB. 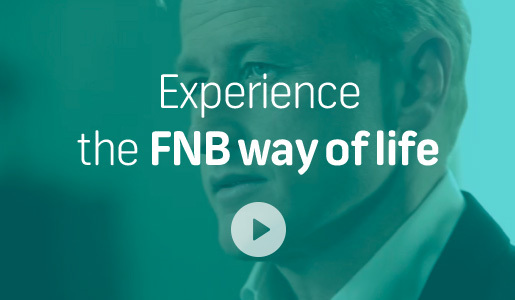 We believe every employee should receive the same great service as our customers, so that you can be part of the FNB brand, inside and out. You can also receive a great range of discounts by depositing your salary into your FNB account. Life at FNB isn't ordinary either. We're driven to help. Because we believe help is at the heart of human greatness. Our vision is to be a great business helping to create a better world. We want to inspire greatness in our clients, ourselves and each other. Which is why our FNB culture is so unique. When you join FNB, you can expect more than just a salary and basic benefits. We believe our people give their all and in return, we're committed to looking after our people and creating a great work experience that is rewarding on every level. At FNB, we're a lot more than just banking, finance and numbers. We strongly believe in helping to create a better world. And not just through the work we do on a daily basis that impacts our customers and the industry, but through inspiring and encouraging our people to get involved in projects outside their day jobs. FNB is the non-bank bank. So working here is not going to be like working at any other financial institution. Every FNBer has their own unique story to tell. 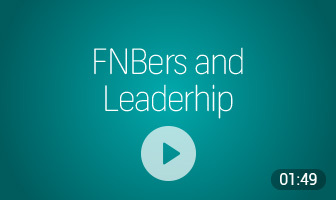 So find out why they love working at FNB and what excites them about coming to work every day.